Uganda's Prime Minister, standing center-left, addresses Members of Parliament in Kampala, Uganda, Sept. 21, 2017. 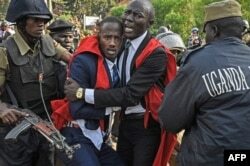 Uganda's ruling National Resistance Movement was expected to introduce a motion in parliament Thursday to scrap the Constitution's presidential age limit of 75 years old. The plan, however, has met with protests in the capital and fierce resistance from opposition lawmakers. At Makerere University, students in red gowns came out of their residence halls Thursday morning, blowing vuvuzelas and whistles and chanting in the Luganda language, "Don't touch it." By "it," they mean the Constitution. "We shall not allow this indirect dictatorship of President Kaguta Museveni," said one of the students. "We are here to defend our rights. Every hope has been taken by President Museveni. The NRM Kingdom is taking away our rights, so we have to defend, we have to defend, we have to fight for our constitution." Students of Makerere University clash with police officers during a protest against the official procedure to scrap a presidential age limit from the constitution in Kampala on Sept. 21, 2017. Their aim was to march to parliament, where a ruling National Resistance Movement legislator was expected to take the first step Thursday toward scrapping the presidential age limit of 75, which is mandated in the Constitution. ​Before the students reached the university gates, riot police swung into action, firing tear gas. 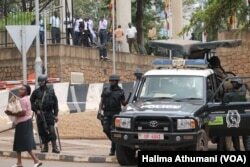 Anti-terrorism police stand guard outside the parliament building in Kampala, Uganda, Sept. 21, 2017, as legislators meet to consider an amendment to the Constitution to lift the presidential age limit. President Yoweri Museveni has been in office since 1986. If the age limit is eliminated, he could be eligible to run in elections planned for 2021. By law, it is the attorney general who introduces a constitutional amendment to parliament. Last week, however, the ruling party said one of its legislators will introduce a motion seeking leave from parliament to introduce a so-called private member bill to amend the Constitution and lift the age limit. Deputy Attorney General Mwesigwa Rukutana told VOA Thursday he will not stand in their way. Anti-riot police walk the streets of Kampala, Uganda, Sept. 21, 2017, searching for protesters against the lifting the constitutional age limit for presidents. "We are not interested in taking it over," he said, "because we trust the private member and the institution of parliament are well placed to handle the bill, and there is nothing wrong in us as Cabinet to support what he is doing." 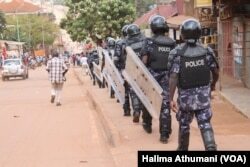 Security forces have been deployed throughout the capital, Kampala, over the past week, leading the opposition to accuse the government of intimidation. The parliament building remains under heavy guard. VOA watched Thursday as police detained several prominent opposition politicians outside the building and took them away. The opposition said other members were kept under house arrest. After parliament opened its session Thursday, the leader of all opposition parliament members, Winnie Kiiza, took the floor. "I would want to ask that government comes up with an explanation as to why there was siege on parliament," she said. "Some members of parliament who are here, right honorable speaker, their homes were surrounded and that's why I am speaking. I am speaking as a victim." Prime Minister Ruhakana Rugunda was invited to respond. However, as soon he started speaking, legislators began whistling and heckling him. Some started singing the national anthem. Deputy Speaker of Parliament Jacob Oulanyah struggled to keep order in the fully-packed house and eventually sent everyone home. "This matter that is bringing you tension is not here today, and a proper process will handle it," he said. "But its implications have been there. So since there are two big problems which I have just enumerated ... this house is adjourned to Tuesday 2:00 o'clock." 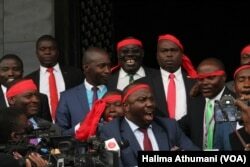 Ugandan opposition legislators sing outside the Parliament building in Kampala, Uganda, Sept. 21, 2017, after a motion to amend the Constitution failed. They left Parliament singing and said every day the Constitution remains untouched is a win. The ruling party did not introduce its motion Thursday and did not comment on whether it plans to do so next week. They left parliament singing and told reporters that every day the Constitution remains untouched is a win.